Jude and Stevie are cousins with Jude being the older one. Both boys haven’t any real friends of their own so they tend to make do with each other. Ever since Jude’s father died he has been on a path of destruction. Frequent outbursts of violence have kept the neighborhood kids away. Stevie, on the other hand, is a meek boy with echolalia amongst other developmental disorders, this makes him a target for bullying. Left only with each other as companions the boys have managed to carve out quite an adventurous summer for themselves. With a tree fort out in the middle of the woods and a spooky old abandoned house sitting along the path through the woods we have the ingredients for something terrible to occur. Ah, and of course it does. Jude has gone missing. With a half-hearted search from authorities, Jude finally makes his way back home after 3 days without much memory of what happened. But there is something different about Jude. Stevie notices right away yet when trying to explain it to his mother she dismisses his concerns. Jude has become secretive and while he was once tolerant of Stevie’s problems he has now become rather nasty towards him. Stevie is determined to find out what happened to Jude while he was away. The town has always been a bit strange, for one, no one seems to keep a pet. Oh, there are animals around but they just don’t want to be kept. Stray cats are seen lurking about and in a way Jude has become a bit like them. Sneaking out and being gone for hours, Stevie knows he must follow Jude if he wants answers, but he is also afraid of what he’ll find. In the meantime, with all his nosing around Stevie is learning there are some things that no one wants to talk about. And that old abandoned house? Hmm… there is more to it than just its ramshackle structure. With a story all of its own, we learn about the house and its inhabitants through a running background telling. This was a good read, a little like the dark side of coming of age. Stevie is a kid you can like but at times get annoyed with, his mom seems typical of those who are in an abusive relationship and who don’t want to rock the boat. With Jude, we feel where he is coming from. All in all, the characters are developed rather nicely to keep us interested in them. The pacing is steady and tension mounts superbly. 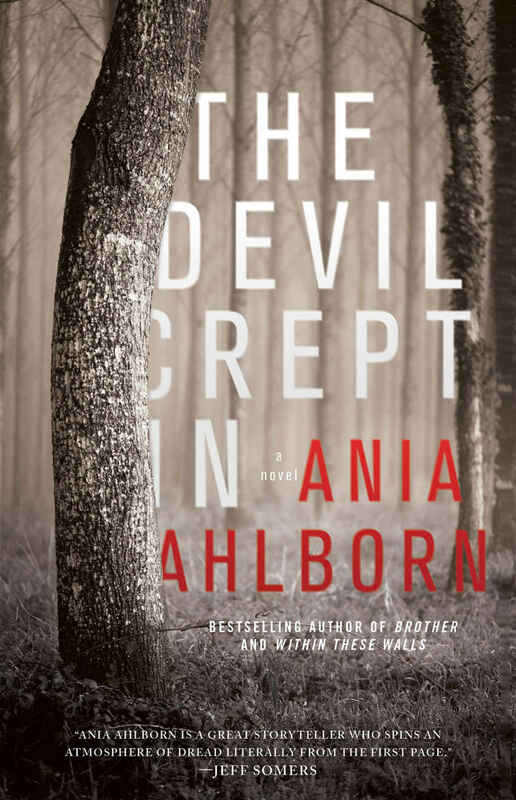 If you would like to pick up a copy of The Devil Crept In by Ania Ahlborn, you can get it HERE! !